Our belief was the North Texas was a region full of entrepreneurs and future entrepreneurs. In 2013, there were several great things already going on in the entrepreneurial community including Tech Wildcatters, cofounded by Gabriella Draney Zielke; The Gravity Centre led by future DEC cofounder Jennifer Conley; and Alexander Muse had started something called Dallas Startup Happy Hour, and Tech Fort Worth, who had been around for many years helping to support and incubate companies in Fort Worth. However, there was not a central place created to be a source for education, training, mentorship, networking, access to capital and promotion. We wanted to create the DEC to be a place that not only supported current and aspiring entrepreneurs, but also worked to highlight and promote entrepreneurs, companies, accelerators, incubators, and other support organizations across the region that were helping entrepreneurs be succeed and grow. After traveling around the country and evaluating other entrepreneurial ecosystems while working with Steve Case and team on The Startup America Partnership (a partnership between the Case Foundation, The Kauffman Foundation, and the White House to help support high-growth entrepreneurs across the country) I saw that other cities (like Chicago with 1871, Nashville with The Entrepreneur Center and DC which had just launched 1776) were creating these “entrepreneur centers” to provide necessary tools and resources to help entrepreneurs grow. 1. Help aggregate existing entrepreneurs that needed be networked and connected in Dallas. 2. Help teach aspiring entrepreneurs how to effectively start, build and grow their businesses with success. When we opened our doors, we started to host programs, events and different networking and educational meetings. Some of the programs we launched here in Dallas included CoFounder’s Lab, Lean Startup Machine, 1 Million Cups Dallas, Startup Next, and more. 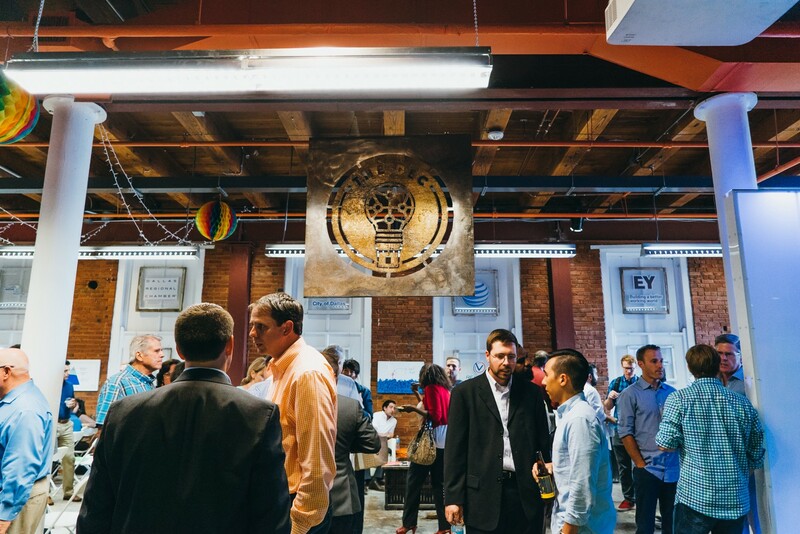 We also leveraged our location to hold programs that had been created already in the community like DFW Startup Happy Hour, Dallas Startup Grind, Startup Weekend, and more. We began to see that by bringing into DFW proven programs that were working in other communities we could a) establish events and programs that we felt confident could help entrepreneurs and b) create opportunities for different people across DFW to take leadership roles and help build and grow these events throughout the region. There was already a State of the City and State of Education, but nothing that had been dedicated to highlighting and promoting the success of entrepreneurs across North Texas. We took the opportunity to build this event to showcase all of the great things going on with accelerators, incubators, investors, academic institutions, media outlets and corporate innovation departments. This event has become a staple in our annual calendar to showcase the wins, launches, exits, and fundings of entrepreneurs and support organizations across the North Texas region. The growth of the State of Entrepreneurship really mirrored the growth of the DFW entrepreneurial community. Beginning in 2014 with 75 attendees, it then grew to 450 in 2015 and 750 in 2016. We saw attendance rise to nearly 900 in 2017 and in April 2018 we had more than 1100 people show up at the Majestic Theatre to see the highlights of the last 12 months for entrepreneurship in North Texas. All of this equated to $130,000,000 in ANNUAL economic impact to the DFW community. This was working. The education, mentorship and community services we had created were actually helping companies be more successful. We also decided at this time that we wanted to reach out across North Texas and meet entrepreneurs where they were. We understood that not all entrepreneurs could or would come to downtown Dallas to The DEC to get access to these services… so we went to them. We started in late 2014 with a location in the Town of Addison, The Addison TreeHouse, in partnership with Addison’s Economic Development Department, and then we added a franchise location in San Antonio (which no longer exists) San Antonio Entrepreneur Center and then we added another location in downtown Dallas called the Innovation Hub. In 2016 we launched a location in Denton called Stoke which continues to thrive and support the great entrepreneurs in Denton County. Just last year we announced three new locations which will be in Southern Dallas and led by Michelle Williams. Two locations will be in conjunction with local colleges (UNTD which has already launched and Paul Quinn College) and the third, RedBird Entrepreneur Center, which will be under construction soon and launched later in 2018. This stand alone location will be in the Red Bird Mall which is being completely redeveloped over the next 2–3 years. As of today, more than 100,000 people have come through the doors of The DEC, but that does not touch the total number of people that have been served through accelerators, incubators, academic institutions, and coworking spaces across North Texas. I believe we have just begun to scratch the service of the vast community of entrepreneurs and aspiring entrepreneurs who can benefit from the robust entrepreneurial ecosystem that we have worked to support across the DFW region. And as The DEC grew so did the rest of the ecosystem... We saw accelerators like Health Wildcatters run by Hubert Zajicek and Loren Bolton and RevTech Accelerator with a great team of David Matthews, Jonathan Fine, and Meagan Moakes (2018 Finalist for Startup Evangelists of The Year) coming into prominence. Under the leadership of Steve Guengerich and Bryan Chambers, UTD continues to grow its different programs, which now includes an accelerator and the Blackstone LaunchPad program. New leadership has breathed life once again into Launch DFW through Jasmin Brand, Clarisa Lindenmeyer and Caitlin Studley. We have seen events/programs like Open Coffee Club (there are currently 10 across the region) Dallas New Tech where companies get to pitch their ideas monthly, we are now up to three different 1 Million Cups across North Texas (Dallas, Fort Worth, and now Frisco), and so much more. 24+ innovation centers, hubs, or experience centers across the region. DFW was 14th in the country in investment since 2010 with more than $5.4BB going into startups. However, we were 10th in the country in terms of return-on-investment (ROI)during that same time period. When we see a company/entrepreneur grow to a point where it is time for them to move on from The DEC to get their own office space, or because they were bought by another entity, or they raised money and have the chance to move in with an investor or other funded organization, we have a celebration for the “graduation” of that company into the next stage of growth for their business. As an early stage business you must celebrate the successes or inflection points of growth. Maybe that is your first paying customer, getting your first round of funding, hiring your first employee or growing out of your coworking space/entrepreneur center. Today, I am announcing my move to Executive Chairman of The DEC and I will spend the next few months interviewing qualified candidates to come in and serve as our new Executive Director. The role of ED will be to run the day-to-day operations of The DEC and help plan the next phase of our growth to continue to serve entrepreneurs across Texas. In my role as Executive Chairman, I will remain very engaged in The DEC and the entrepreneurial scene in DFW and as Executive Chairman I will be able to more effectively support The DEC and this community in a strategic planning role. I am currently exploring some exciting projects and opportunities that I look forward to sharing you, but in the short term, my focus is to spend the next few months finding our new leadership and planning the launch of our new location at the Centrum with The Capital Factory. One of the statistics we mentioned was that there are now 62 different coworking spaces in Dallas. When we started The DEC five years ago, our mission was not about building a coworking space. We were going to do anything and everything we could to support entrepreneurs as they start, build, and grow their business. In 2013 that meant launching a coworking space in downtown Dallas. Today, with so many options for coworking in downtown we have the opportunity to focus on our core mission which is to bring tools, resources, and mentorship through programs/events and community. We will continue to have a presence in the West End (more specifics coming soon) and we will continue to offer coworking in Addison (at The Addison TreeHouse) and in Southern Dallas at the RedBird Entrepreneur Center, as well as any other future location of the DEC to support entrepreneurs in local geographies. So, effective June 1st, The DEC will move its primary location to the Centrum to have our headquarters in that location. This is only the beginning for The DEC in terms of our plan and contributions to the North Texas entrepreneurial community. We will continue to highlight the amazing work of entrepreneurs, startups, investors, academic institutions and others that make this the best place in the country to start, build and grow a business, and as we continue to see different stakeholders come into the community to support and serve entrepreneurs, we will continue to see this ecosystem grow and thrive. DFW is a “can-do” entrepreneurial community where we work together to support each other every day. I will continue to consider it one of the greatest blessings of my life to work with entrepreneurs, investors and other stakeholders to make this one of the most collaborative and effective ecosystems for entrepreneurs on the planet. As I “graduate” to the next part of my journey I want to encourage the community to continue to work together and collaborate. We have realized amazing growth over the last five years as a result of the cumulative impact of the leaders and organizations in this community. The power and impact of North Texas comes from the wins and successes of our different groups. A company that gets funded in Fort Worth is a win for the entire ecosystem. An accelerator that launches in Frisco will benefit all of the accelerators in town. An exit for a company in downtown Dallas will drive more interest in other companies coming out of this region and the success of a well diversified startup will give more evidence that a well diversified leadership team is not only the right type of business to build, but it will also be the most profitable businesses that we see exist in the future. I would also encourage the community to celebrate a “give first” mentality where we each search for our opportunities to serve and add value to the overall ecosystem. Let’s continue to connect with investors, entrepreneurs and other support organizations across the state where we can have not only a robust ecosystem in DFW but a collaborative one across the state that will make Texas the most fundable and effective startup community in the country. Thank you to all who have come through our doors at The DEC. Thank you to the countless number of volunteers, Ambassadors, mentors, investors and supporters who have made the DFW entrepreneurial ecosystem what it is today.